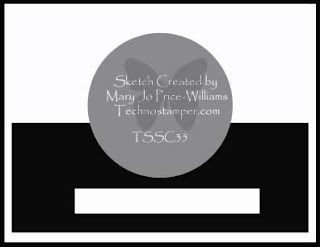 Another Monday....another sketch from MJ at TechnoStamper. For this weeks sketch I used my Upsy Daisy and Pocket Silhouette Stamps - both of which are on special through September 30th. If you haven't ordered yours yet, you can click here to shop online - or email me to place your order. Here's the original sketch if you'd like to play along. If you upload to SCS, please use keyword TSSC35. Lisa, this is stunning! I just love this set. How are you getting such a clear image though. I have tried an eraser, sanding block, paper bag, jeans, Stazon and I don't know what else and it is still not that clear. I guess it is not supposed to be but I want it to be! I absolutely love this is these colors! You rock, thanks so much for playing along. Gorgeous!! 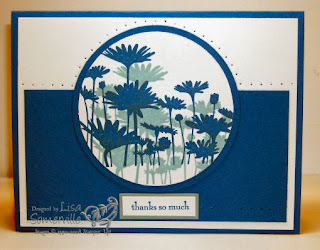 Love this stamp set...it works with whatever color you please and you worked it with the blues! Beautiful in blue and classy too!! Love the way you paper pierced along the top; this give so much interesting detail. Gooooooregous! So crisp and clean. I love this image, and I just might break down and order it! I love blue also, so this is just perfect in my book! Beatiful card, Lisa! Great color combo and layout! Beautiful card Lisa! The circle is a great focal point. Those flowers really pop out at ya! Stunning! Interesting how we both used the same set, dressed it up differently, and ended up with totally different looks....but still used the same layout. LOVE your! !